On November 16th, 2014, I officially over 50,000 words. 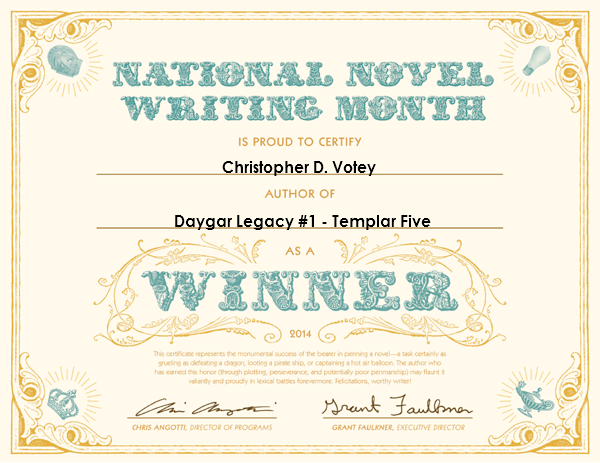 My story, which will be turned into five books, was Daygar Legacy #1 – Templar Five. The story is about Vampires in the 14th century spreading a disease that is killing humans at an alarming rate and five knights of the former Templar Knights attempt to make a deal with the devil to try to win the war. This was a challenging time. Mostly because of my disability, I couldn’t do as much as I wanted. I aimed to finish by the 14th like I did last year. I came close, but I was shy 2 days. I think that is still very impressive. Also, given that I am a science fiction writer and I am doing Historical Fiction, Fantasy, and Paranormal, it was hard at times for me to write. Completely out of my comfort zone. As I wrote, I had to do additional research on the time period to get key facts correct. I want to thank the creators of Write Monkey, as with their software, I was able to write my story despite my sensitivity to light. I dedicate my success this year to all those with disabilities, whether with Post-Concussion Syndrome, those with Traumatic Brain Injuries, or other disabilities that prevents someone from living they life they want. Writing was very hard for me, and the only way I did it was by forcing myself to do it, even if my brain wanted to give up. My reward is the next two weeks off. With Thanksgiving coming up, and a few other special projects I am currently engaged in, I am taking a break from this blog. I will come back in December, hopefully to finish up my rivers on the worldbuilding tutorial. However, I will be limited in December. I plan to come back in full force in January. Special thanks to Nicohle Christopherson for giving me emotional support during NaNo. 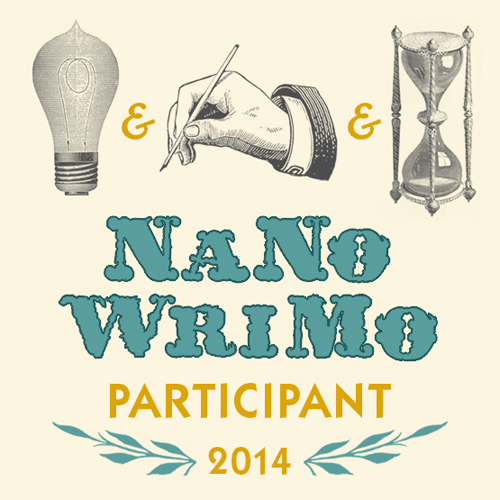 NaNoWriMo brings out the writers in all of us. All of us dream big and want to do something fantastic. Some is to show what we can do, others want to make something of work. Whatever the reason, we get together for the month of November and compete against ourselves to get 50,000 words within 30 days. My progress? By Day 5, I got 21,173. I took the day off yesterday, as my disability got the best of me. Even now, I am still 6 days ahead. I intend to start up again and do 5k days until I get 57,204. One of the most disheartening things I see, is people quitting early. Often, it is due to people putting a lot of stress on themselves, often over thinking their story or worrying about the wrong thing. I want people to succeed. Give my success last year and my probable success this year, I made a video that will reveal to anyone who wants to do better what I did to be so accomplished. Maybe my advice is for you, maybe it is not. I do believe it is worth a listen.